These days, homeowners have a wide range of flooring options to choose from to make the most of their property. Whether you’re shopping for a comfortable floor system to provide your family with years of warmth or you’re a landlord looking for a cost-effective solution that retains your home’s beauty and value, laminate flooring has grown to become a top choice for many professionals and DIYers. Installing your own floor system can prove to be rewarding and cost-effective, but remember that small mistakes throughout the process can lead to major repairs. One way to protect your new floor from minor imperfections and moisture concerns is to invest in a flooring underlayment. Eco Cork Foam is here to serve as the best underlayment for laminate flooring, providing complete protection, warmth, and acoustical comfort for a variety of uses. Before you decide to make the most of your laminate flooring with our underlayment, be sure to read up on some of our tips below to improve the outcome for those new to the installation process. Want to learn more about our floor underlayment? Contact us today, and be sure to pick up a roll from your local Home Depot®! 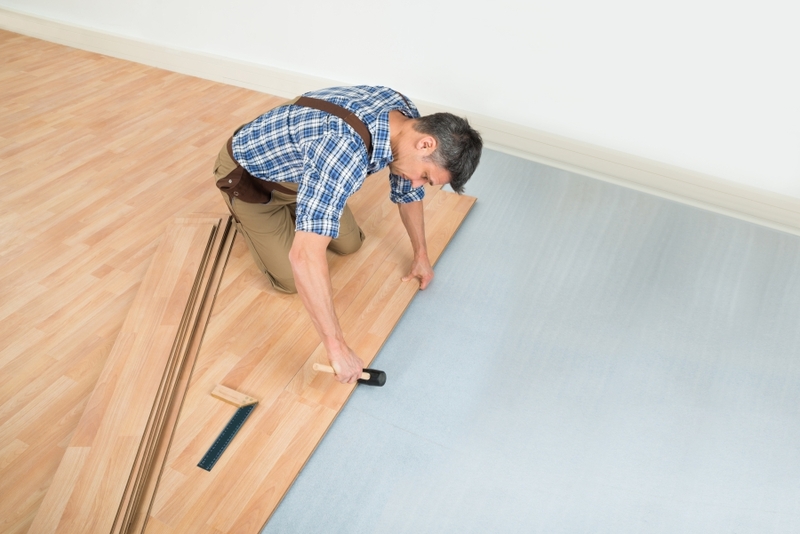 It can be exciting to begin your own flooring installation, but keep in mind that the adage of measuring twice and cutting once applies perfectly to this situation. Visible defects — Damage can be done to your flooring materials during transit or while in the warehouse or showroom. Be sure to look over your boxes when unpacking the laminate planks, and inspect each bundle for any unsightly damages. Pattern consistencies — Laminate flooring is designed to provide a seamless look when finished, so be sure to check the color and style (wood grain, for example) are consistent and that you can line up the pattern accordingly. Structural concerns — Each plank should feel consistent in weight and rigidity. If you notice any boxes that differ in structure, be sure to set them aside. It doesn’t pay to install a damaged floor material! Laminate flooring can provide serious longevity and value, but only if the proper preparations are done before installation. It’s important to set time aside to focus on the subfloor, as any small imperfections can lead to big headaches later on. Start by going over your entire subfloor. If you notice that the surface is covered with moisture, is not level, or is not in an overall quality condition, it’s important to address these issues before you move on. Dirt and debris can become trapped under planks and disrupt the locking system, impacting user comfort and product longevity. Spots that are damaged should be repaired, including loose boards. It is absolutely vital to take steps to ensure your laminate flooring is properly accustomed to the environment it is being installed in to prevent any future issues. Improper product storage and poor ambient air control can cause the materials to expand and contract, creating serious issues after installation. It is important to keep your project room consistently warm and dry to create the best results throughout the installation process. During the wait, store your boxes horizontally in the installation area, cross-stacking unopened boxes for the best results. 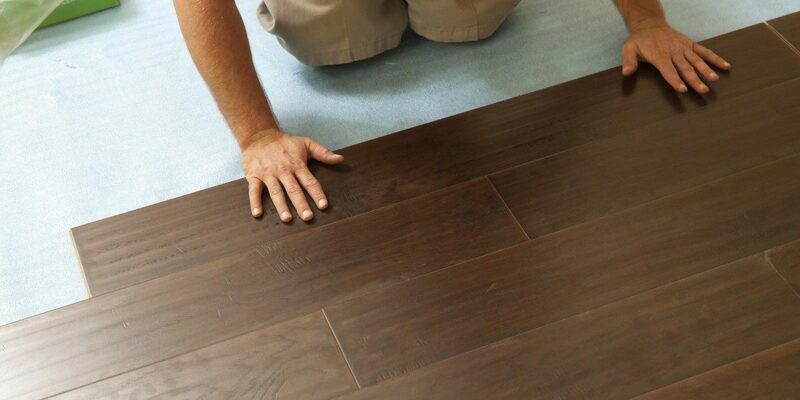 Installing a floor system in the colder months will require your laminate to sit for longer. While the standard wait time for product acclimation is at least 24 hours, you may need to plan on leaving your boxes of laminate in the room for 48 hours to be safe. As a floating floor system, laminate flooring functions best when it is not nailed or glued down. Remember that this fluid base allows the material to expand and contract with environmental conditions, as small movement will be expected. DIYers that prefer a snug fit will be tempted to put their planks up against the walls, along with cabinets, pipes, and stairs, but doing so can lead to unwanted buckling! It is always recommended to utilize a set spacing for your laminate flooring system. Installing planks too close to the wall, for example, can leave too little room for movement, crowding the floor until the planks begin to bunch up and buckle. Check your product’s instructions, as manufacturers provide a full range of specifications and suggestions for a quality outcome. While not technical advice, we recommend allocating enough time to ensure you are not hurried to finish up. Hurrying in the professional world can create costly mistakes, and for DIYers, the results may end up worse! Take the time to measure, cut, and fit all components properly. If you cut corners now, the results are likely to bug you over the years, so put forth the effort now to create the most qualitative results. One of the best ways to protect your new floor is to invest in a quality laminate underlayment. Eco Cork Foam is formulated to deliver the best results, including rigid support for tongue-and-groove connections. Our floor underlayment’s ⅛-inch thickness allows for stronger joints. ECF also provides the best results for concrete subfloors and concrete floors, as our underlayment comes with a built-in waterproof vapor barrier! It also helps to smooth out minor imperfections, creating more comfort once all is said and done. Eco Cork Foam is here to provide ideal support for professionals and DIYers in need of a quality laminate flooring underlayment. Contact us today to see just how amazing our product can be for your floor system, and be sure to buy a roll from your local Home Depot to get started!